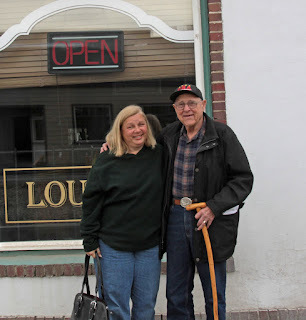 I mentioned in my last post that when I was in Nez Perce, Id, I met a D Day Vet named Joe Meiner. He was participating in the age old "talk around the wood stove at the local store", except it was at the local hotel/restaurant and no wood stove was needed (thank God). This is what the old timers did back in the old days - made their way to the general store and sat around the wood stove talking about weather, crops, local families and their difficulties or successes, national and world events such as were known back then (news was often heard a day or so or more after it occurred). 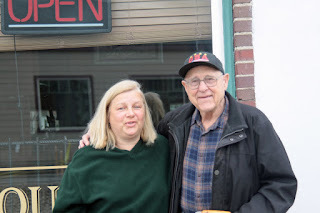 I don't know much about Joe's personal life except he knows all the locals and can tell you the history of any plot of property in the Nez Perce area and who has owned it. I don't know if his wife was still alive, but from the way he talked I didn't think so. Joe is 86 years old and this past summer he went with his grown great grandson to Washington, DC to visit the WWII memorial. The memorial featured black and white reels of war footage and Joe pointed out the truck he was driving in the D Day footage - yes, he was actually, momentarily, in the footage. As Joe told his great grandson about the war, about D Day and what it was like, others visiting the memorial would overhear and gather around to hear it all "first hand". He attracted crowds everywhere he went, and not on purpose. Joe speaks softly and deliberately, he is very modest and never embellishes anything. In fact, he probably undertells it and his voice is very matter of fact. He told us, in the Nez Perce Hotel dining/meeting room how he was a mechanic for the vehicles, mostly trucks and jeeps, and how he had to drive a truck onto the beach (I forgot to ask which one - I was too riveted by his story and I didn't want to be rude and interrupt) and get as far as he could directly under the guns of the Germans. He managed to do this, obviously, or we would not have been speaking to him. He was so far onto the beach, the Germans could not train their guns on him. As he drove, he saw men dying left and right of him, and when he got to his designated spot, he says he saw no bullet holes in his truck - he was amazed. He seemed so proud of his great grandson, and he was happy that a WWII memorial had finally been completed. He was quite pleased with his sudden fame while in Washington, DC and his face glowed as he spoke of how "one or two people would hear me talking to my great grandson, and before you know it, there might be a crowd of upwards of 25 or so people wantin' to hear about the War." Joe did mention that he had never been able to watch, "Saving Private Ryan", because it would be too intense for him, it would bring it all back - but he did say that others that he knew that had been in D Day and seen the movie, vouched for it's authenticity. 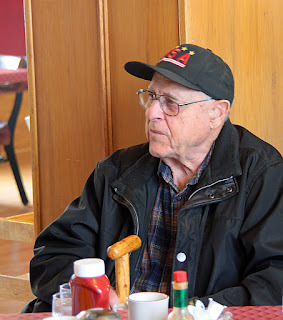 Before we left the Nez Perce restaurant, my husband, my brother in law and I thanked Joe for what he had done all those years ago, and I could feel the chills run up my spine. I felt as if I was talking to a real piece of History in Human Form, so to speak. I have so much respect for the "average American" of the first half of the 20th Century. These people - and Joe was the epitome of this - were full of integrity, honesty, unpretentious, unselfish, brave and matter of fact about it all - all the qualities that made America and Americans great. Joe only uses a cane, so he gets around pretty good. His granddaughter works at the local grocery - we stopped there to pick up some fresh coffee to go (there is NO place in the Northwest that is inhabited by more than 2 people that does not have EXCELLENT coffee, including offerings of mocha, lattes, and espressos. We stopped at one place in a small town that was a hardware/liquor/gift/feed and ANY kind of coffee such as Starbucks would offer). We said hello to his granddaughter and mentioned how we had met Joe and how wonderful he was. She grinned and nodded in pride. As we were all leaving the restaurant/hotel to go our various ways, Joe had decided to move on also, so we stayed together a bit longer as we walked out together. I suddenly got the urge to have my picture taken with this WWII vet - to me, more exciting than having my picture taken with any dumb celebrity (celebrities are usually the last people I'd want to have my picture taken with). I tapped his arm and asked if he would mind if my husband took my picture with him and he smiled and said, "Sure". We posed with our arms around each other and smiled. I told him I was absolutely in awe of what he had done in the war and I was so proud to meet him. I told him I would never forget him and what he had done - and I won't. For some reason, amidst all the wonderful scenery and fabulous hotels and great food, this is the high point of my trip. Below are a couple of pictures of Joe - one in the hotel/restaurant where he was sitting and talking with us, and two of him and I. 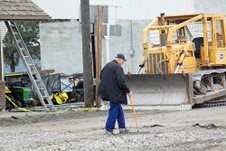 After the picture was taken, Joe went off alone, leaning a bit on his cane, crossing the street in the little Northwest Camas Prairie town, toward where he lives. Watching that old man, alone, going carefully and slowly down the street, holding inside himself a lifetime of memories of America when it was a better place, and a war halfway across the world and planets away from tiny Nez Perce, Id., I got choked up. I felt I was watching as the America I knew was moving farther and farther away, and with the passing of the Greatest Generation, passes the time of America's greatness. Fine work on your part.....extremely well done! Idaho is.....the Way America Was! Thanks!! It was written from my heart. i love you're stories of Nezperce. I work with "Grandads", as we all call him, Granddaughter Karen and you are right. we are all very proud of him and honored also. we all love Mike and Mare and look forward to seeing them each week. or every other week, but can't wait for them to be here permanetly. they fit right in our town. Thanks so much for reading my blog and writing your comment!! Meeting Joe meant a lot to me - all I have to do is imagine all those young men spilling onto the beaches at Normandy - and I'm thankful for their bravery and willingness to risk death to keep freedom here in America. If only there were more people like you...when the "Joes" are around. They have stories to be told..that need to be told and to be appreciated. I am afraid the history books will be rewritten and alot of the past that made a free America..today...will be left out.How will the youngsters learn the sacrifice that it took from so many many people? You need to work for and fight for freedom to know it's true value. We're losing that. You were a blessing for each other. Thanks, Carol - it was an honor to meet him - few men are like him anymore. My dad & I had a similar encounter with Mr Meiner just Tuesday right in the grocery store in Nez Perce. What an amazing man & blessing to our country.